The Agents of S.H.I.E.L.D. season 4 episode 'Lockup,' saw Agent May (Ming-Na Wen) return to field duty after Simmons and Radcliffe were forced to kill her following her exposure to Lucy Bauer (leader of the "ghosts"). While in route to spring Robbie Reyes' (Gabriel Luna) uncle from prison, Phil Coulson (Clark Gregg) questioned May regarding her "death" experience. Coulson, who famously died himself in The Avengers, was curious what May saw - as he reminds us, his memories were wiped away in favor of a pleasant trip to Tahiti. While May sidestepped the question at first, she finally did answer while the duo were trying to save Daisy (Chloe Bennet) from an angry mob of Watchdog prison inmates. So what did May see during death? Phil Coulson. Coulson and May have had a strong relationship (though platonic) since the beginning of the series. May has always been a staunch defender of Coulson, and his most trusted confidant. But could the series be laying the groundwork for a possible Coulson/May romance? Well, according to series star, Clark Gregg, something certainly appears to be happening. 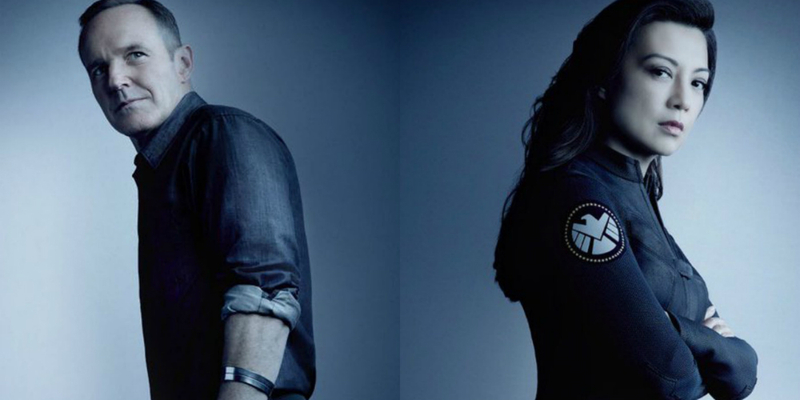 Both May and Coulson have had their share of relationship difficulties thus far on Agents of S.H.I.E.L.D. May's most prominent significant others are Hydra double agent, Grant Ward (Brett Dalton) and psychiatrist-turned Inhuman killer Andrew Garner (Blair Underwood). While those relationships did not turn out well, Coulson's luck has not been much better. We briefly met his cellist "girlfriend" in season 1, before Coulson developed a relationship with the head of the ATCU, Rosalind Price (Constance Zimmer) in season 3. Unfortunately, Price was killed by Ward as part of his grudge against S.H.I.E.L.D. and Coulson. A Coulson/May relationship holds promise as the two have very different personalities, which could lead to a compelling on screen romance. While Coulson displays his trademark charm and penchant for caring, May is much more often seen as distant and calculating. The series is, however, beginning to peel away the layers of Melinda May, and it sounds like she and Coulson will grow closer. Despite the characters' differences, there is a strong cohort of fans who would like to see them take their relationship to the next level - much like Fitz and Simmons have this season. In fact, according to CBR, the fanfiction website, “An Archive of Our Own” shows "1622 works of fan fiction featuring May and Coulson as an item." Whether Coulson and May's relationship evolves into a romantic one for real, we will have to wait and see. Agents of S.H.I.E.L.D. continues with ‘The Good Samaritan’ Tuesday, November 1 at 10pm on ABC.